It’s 2012. There are no more adventures. Been there, done that, seen it, ho hum, right? There are still adventures to be had in this world, and several of them happened this past week. 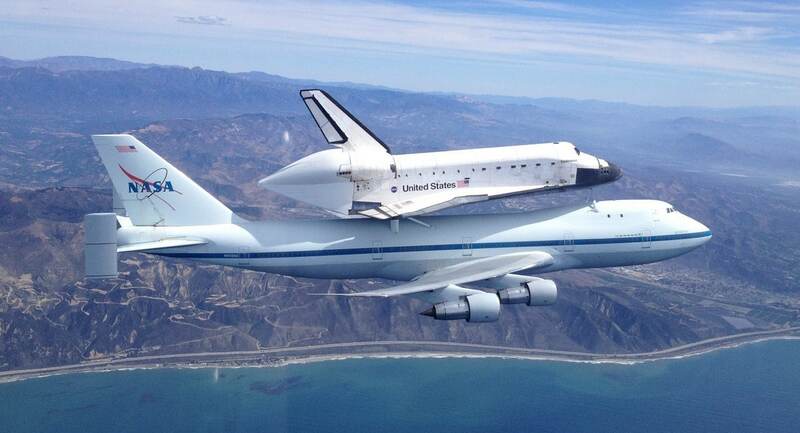 First was the final trip taken by the Space Shuttle Endeavour, which lived up to its name. (You may not know: it was named after the British sailing ship HMS Endeavour, which took Captain James Cook on his first voyage of discovery to Australia and New Zealand from 1768 to 1771). 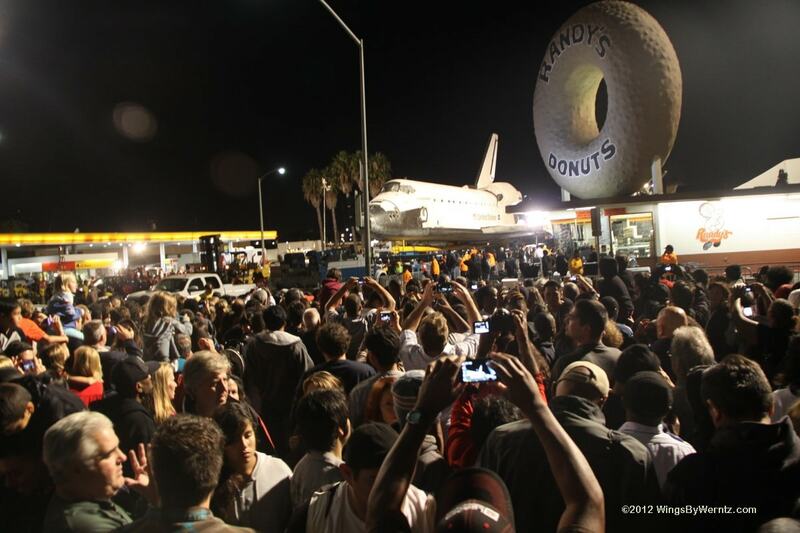 Thousands of Angelinos took to the streets just to watch, to be a part of the event: the retirement of a little-used spacecraft (it only had 122,883,151 miles, or 197,761,262 km, on its odometer, having flown in space for just 296 days, 3 hours, 34 minutes, 2 seconds over 25 missions — not that anyone’s counting). Expansion of human knowledge is number one. In the early days, NASA did a fantastic job of informing the public of what it was doing, the steps it was taking, to make progress. We haven’t seen much of that lately. Indeed, NASA’s “educational outreach” activities have been continually squeezed. Who does a significant portion of such “outreach” now? Volunteers. There isn’t much budget for staff jobs to actually educate the public about what’s going on, what’s being learned. Yet the public is starving for information, yearning to be a part of the NASA Mission. So much so, the entire route Endeavour took through L.A. was packed with people wanting to be a part of it. Day, night — it didn’t matter. People took time off work to go watch. All of the mountains have been climbed. What adventurous thing is there left for an explorer to do anymore? 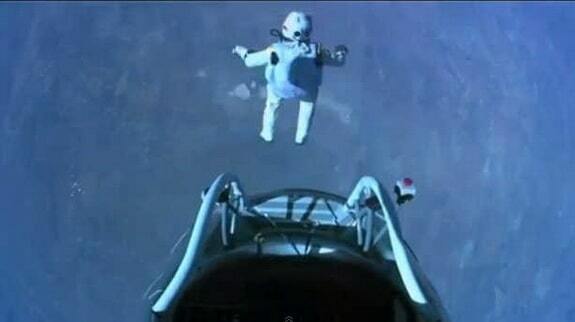 Felix Baumgartner thought of something to do, a record or three to break. On Sunday he flew in a helium balloon higher than any human had ever gone. It took him two and a half hours to get there. And then he jumped out. I was watching, live — and so were hundreds of thousands of others. He allowed only one voice on the radio in his ear to coordinate the event, to go through the checklist to give him the best possible odds to survive the feat: Joe Kittinger. Who’s Joe Kittinger? He’s the guy who was the first to skydive from a balloon from above 100,000 ft — and he did it in 1960 (as part of a U.S. Air Force project, designed to test high-altitude parachutes). 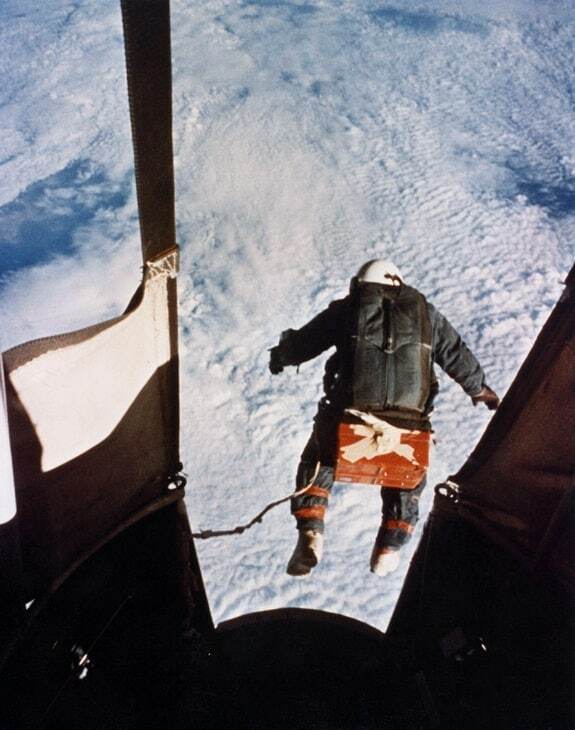 Here’s Kittinger, as he jumped on August 16, 1960, from 102,800 feet (31,300 m). Back in 1960, Kittinger towed a small drogue parachute for stabilization, so he “only” reached a maximum speed of 614 miles per hour (988 kph). He was in freefall for 4 minutes and 36 seconds before he opened his main parachute. Baumgartner didn’t use a drogue chute …and therefore went into a spin, causing him to almost black out. Just in time, he dropped low enough in the atmosphere for there to be atmosphere so he could get enough resistance to stabilize himself. But that enabled him to go faster: an estimated 834 mph (1,342 kph), making him the first human ever to break the sound barrier without the aid of a vehicle. NASA, unfortunately, has been clueless about the accomplishment, which adds valuable new data they can benefit from. Someone at NASA tweeted congratulations (read: some low-level employee in public affairs responsible for the agency’s “social media” took it upon himself to do it). NASA’s official web site? Totally silent more than 24 hours later. That is, in part, why I so heartily support the transition from government-operated spacecraft. Transition to what? Yep: private space vehicles. The Shuttle, magnificent as it was, was a horribly inefficient spacecraft. Each launch cost (when you included development and manufacturing costs) about $1 billion. That’s billion with a B. President George W. Bush was right to cancel the Shuttle program, and President Barack Obama was right to affirm that cancellation and let it go out of business. And there was a spectacular milestone on that front this past week too. It’s about freaking time! It took more than 50 years to get there! Elon Musk, the guy who co-founded Paypal (and sold it to eBay for $1.5 billion) has put his estimated $2.4 billion net worth into something really visionary: he started a rocket company. 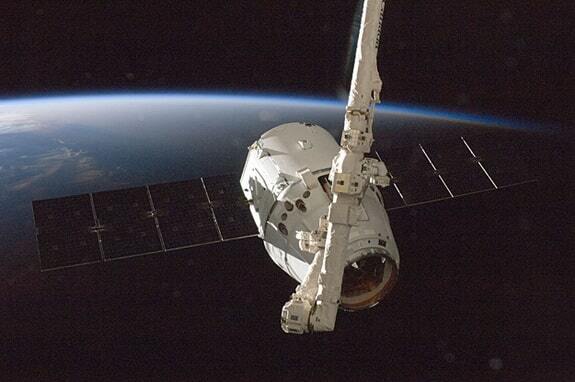 In 2008, his newest company, SpaceX, was awarded a NASA contract for a dozen cargo flights to the Space Station. That didn’t cost NASA $12 billion, which is about what it would cost to do that with the Shuttle. No, the contract was “only” for $1.6 billion. A billion bucks for a shuttle flight vs $160 million for a commercial flight? “The Government” isn’t always known for making great decisions, but that was a great one. 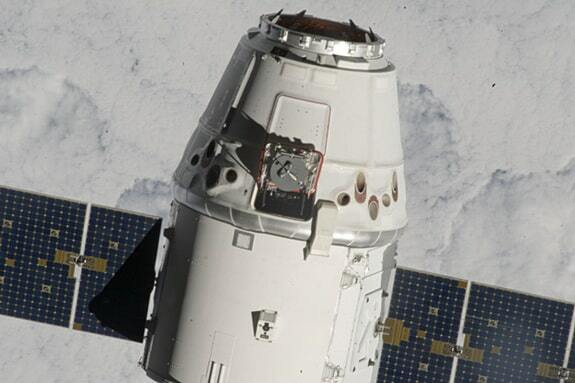 SpaceX’s Dragon spacecraft did a “demonstration” flight to the Space Station in December, and it was a spectacular success. 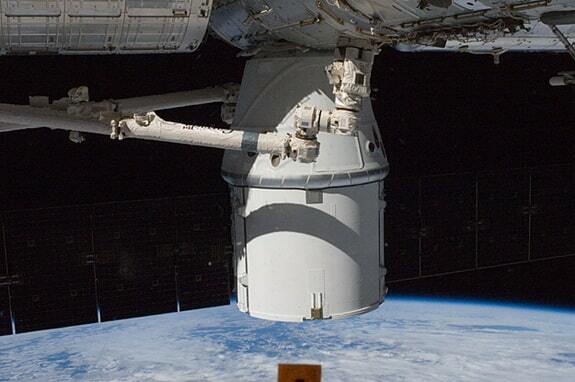 This weekend, the first “real” Dragon arrived at the Space Station with cargo. Yes, the United States is in the space launch business still, even without the Shuttle. And that’s an adventure. Whether you love it because capitalism triumphed or because you just like that we’ve saved billions of dollars, which perhaps means we can do more science in space, doesn’t matter. It’s a terrific success. And I’ll bet that payback didn’t stop in 1987. $355 million in federal corporate income taxes. So yeah: I think there’s a lot of adventure in our future: mind-blowing, thought-provoking, awe-inspiring achievement, and it won’t just be government employees doing it. That’s the best progress of all. Been there, done that, seen it, ho hum? Not on your life. I can hardly wait for the next adventure. They’re out there, if you just apply just a little attention to watch for them. All that happened in the past week. 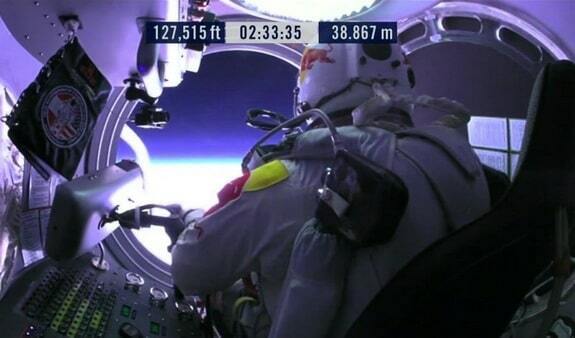 I was glued to Baumgartner’s jump, thanks to your tip (saw it on FB I think). Brought back boyhood memories of watching the moon landings — adrenaline pumping, hanging on every word of the announcer — hoping against hope they make it. What a thrill this was. And thank you for the “adventure” perspective — good insight. (To quote the movie “UP!”: “Adventure is out there.” We just have to go get it.) I believe we’re in for some exciting times as 1) space goes commercial, 2) the internet/computers/phones mature, and 3) our species is forced to solve some enormous challenges over the next decades (and, yes, those three things are intimately related — “an exercise for the student” as my father-in-law, a professor, used to say). Originating in the designs and developments utilized in the thruster technology of the Saturn V rockets that have proven to be so successful in lifting payloads into space, civilian partners ORBITEC and their subsidiary HMA Fire have taken the lessons learned even farther. The creation of UHP or Ultra High Pressure fire suppression systems has given demonstrated and proven capability of putting out fires faster and with less water. These systems not only knock out fires faster, but reduce temperatures and smoke production, making it safer for firefighters to aggressively do their jobs. Less water used means less damage, and extended fire fighting capabilities with the same water payload. One example is the UHP suppression system has repeatedly proven capability of extinguishing a fully engulfed car fire in 9 seconds. HMA’s Hydrus systems are commercially available and being utilized both on their vehicle designs and skid-mounted to be placed on existing fire vehicles. They are seeing duty in Afghanistan at forward firebases and are present on many United States Army, Navy and Air Force bases here at home. This design which began life lifting giant rockets into space, has now proven to be a lifesaver here on planet Earth, and is just one of hundreds of ways that space science benefits mankind. NASA’s Spinoff Site has a lot more examples. 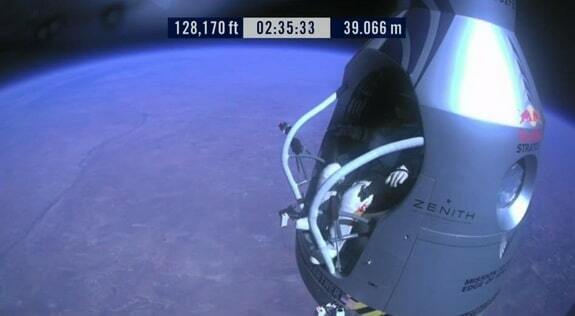 I have 2 questions about Felix’s jump — how much less is gravity at 120,000 ft.? how did he take that second picture — where he is beginning to exit the capsule? Wonderful stories! Just one little point: the captain of the original Endeavour was Lieutenant James Cook. A common mistake to confuse his rank and his position, even among Australians. Re the gravity at 128,000 feet altitude: it is about 6% less than at the earth’s surface. If you didn’t watch this live streaming, you missed something. I don’t know how that guy fit into his suit with cajones that size. Wow! So many things to respond to! If the NAS Act wanted commercialization of space, why was Ford kicked out of the space biz when they tried to enter it? As far as the Chapman report’s “$355 million in federal corporate income taxes” goes, yes, I believe that. However, if that were to happen now that “corporations are people”, how much would those taxes have benefited the country? Won’t the tendency of UHP fire suppression to violently kick around whatever is INSIDE whatever is on fire kinda tend to do as much damage as the actual water? Captain James Cook: “Captain” is a position as well as a rank. When in command of H.M.S. Endeavour, Cook was addressed by his position. I thought the 6% number sounded a bit off, so I dusted off my inverse square law and the Google calculator and indeed it looks like it’s just a touch over 1%. The 6% number is for an orbit about 200km up, which is about the lowest you can go without rapidly losing speed due to atmosphere. The space station is at closer to 300km, more like 9% weaker. I could help but notice in the second photo you’re advertising your new business. Just the perfect sort of business for an ex-cop or EMT to operate. Do you do a special deal on the jelly filled donuts for the shift sergeant? On subject — it’s a shame NASA doesn’t seem interested in doing more on the Moon, like say a permanent base or colony. Well, to respond to “So many things to respond to!”…. But you ARE right in that even non-commissioned enlisted man is still “Captain” if he is the highest ranking leader on board a ship. But ONLY during that command. That’s also why many “Generals” during a war revert back to a lower officer’s rank when the war ends. I actually believe I remember hearing that Ford was attempting to go to into space on their own dime, but were told by the US government not to do so. The more recent “a corporation is a person” legality (as I understand it) is what has enabled corporations to pay so little in taxes in recent years. It’s not so much that it shouldn’t have been done as it is a wasted opportunity to really educate people. One of the worst of mistaken impressions left by the video is that 8 million+ people think 24 miles up is ‘space’. The agreed upon demarcation for space is about 62 miles. Could Redbull done better to educate the audience that tuned in? You bet! Could NASA? You bet! Could the public school system? —Well, you get the idea. I reject the thought that if it isn’t done perfectly, it’s not worth doing. I like to think that someone behind that legislation was familiar with science-fiction writer Robert Heinlein. He wrote two novels — one in 1940, another in 1955 — about a man named D.D. Harriman. He was, as one of the titles put it, The Man Who Sold the Moon. Harriman is “the last of the robber barons” who “spends much of his career and resources making space flight a practical commercial enterprise” (Wikipedia). By hook and by crook, he ends up instigating a ‘gold rush’ to the moon of privately-built spacecraft in search of rumored mineral riches.